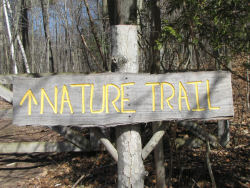 This short nature trail is just off Portage Point Road. Although it's too short to probably make it a destination, it's a great place to stop and stretch your legs if you are going by. The entire system contains about a mile of trail, with some brief glimpses of Portage Lake through the trees. There is a secluded campfire area with no amenities. The description begins at the parking lot. Go around the gate or be sure to latch it behind you if you open it. There is a rustic portal over a trail angling to the right, and this is the beginning of the Upper Trail. You can easily follow this as it angles up the slope of the hill and is lined with rails of logs. There is a bench partway up the hill. A few trees are labeled, including an American Elm, an unusual find. The description begins at the parking lot. Go around the gate, or be sure to latch it behind you if you open it. There is a rustic portal over a trail angling to the right, but stay on the wide lower trail. This will continue fairly straight along the creek valley. Turn south on another wide trail that follows the valley back to the south. Near the end, cross the creek and climb to reach the back of a private barn. Turn around and go back the way you came. Picnicking- There is a campfire pit at the end of the Old Road Trail. An old table has been left there, which could be used to set things on, but there are no benches or chairs. This would be a rustic picnic location, very secluded, no views. Handicap Accessibility- A sport wheelchair could navigate the Old Road Trail as far as the hill to the campfire area. Access- From Portage Point road less than 0.5 mile west of M-22. Parking for two cars if done carefully. Take M-22 north from Onekama or south from Bear Lake. Portage Point Road leads west just where M-22 leaves the north shore of Portage Lake. Turn west on Portage Point Road. The Nature Trail parking is on the north side of the road in about 0.5 mile. Watch for a small rustic sign with yellow letters.